Tickets for all shows will go on sale via SCI Ticketing this Wednesday, January 11th at 11am MST, followed by a public on-sale on Friday, January 13th through venue outlets. 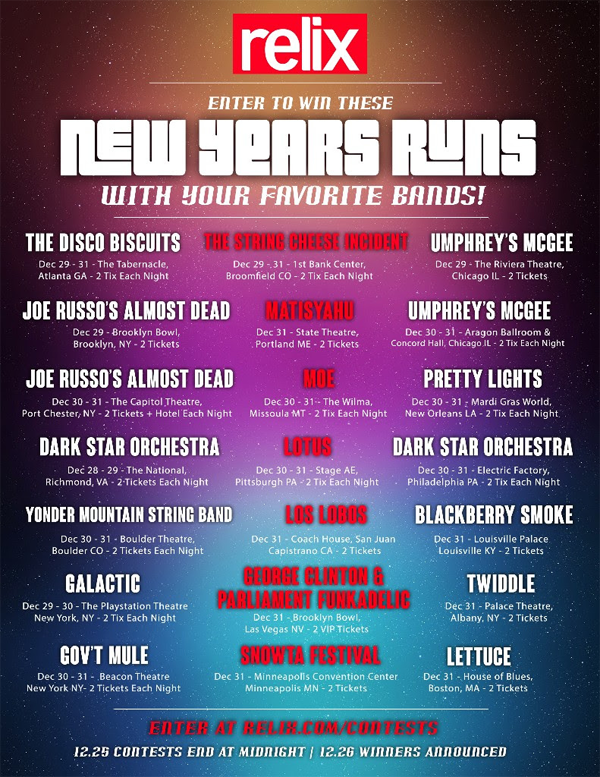 Enter to win tickets to upcoming NYE Runs from your favorite bands: Relix.com/contests. “In May of 2015, the band rented a house in beautiful Sedona, Arizona and spent a week there hanging out and writing songs. We were all feeling especially reconnected to SCI and in a creative space, and sometimes it gets harder and harder to find those moments. So we felt the need to block out a week to get together in some remote part of the country. It proved to be a really productive week – we wrote and worked on over 20 songs! As this was happening, we were in the process of building a studio in our home state of Colorado. We have been a band for 20 years now, and it was about time to have a real creative hub where we could gather easily to record new songs, write, hang out, etc. If we had a studio, we could track new songs instantaneously and get them out to you a lot quicker. When we released “Song In My Head,” we just felt like a lot of the steam was let out when we had been playing the songs for months, if not years prior to the album release. As a band it is always exciting to play them for you when they are really new, or at least not already staples in the repertoire. We have been fortunate over the years to be able to live a bit outside the traditional model of releasing music. 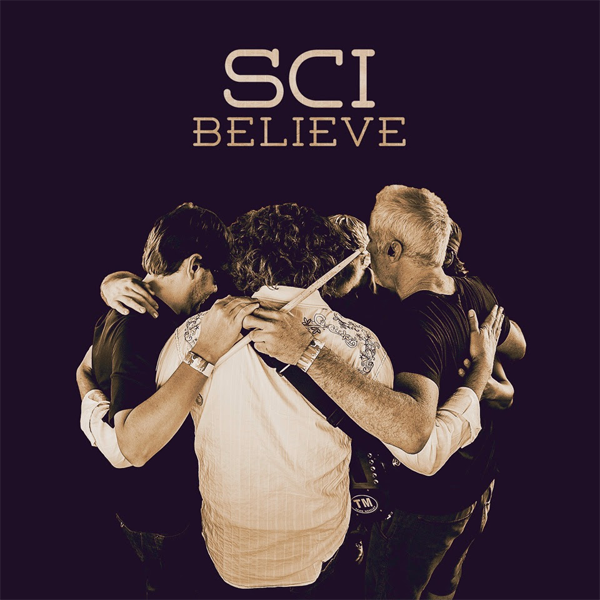 Whether it was releasing all of our live shows or having our own record label, SCI Fidelity, to release our own music and bands we love, we feel really lucky to have been able to make our own rules. 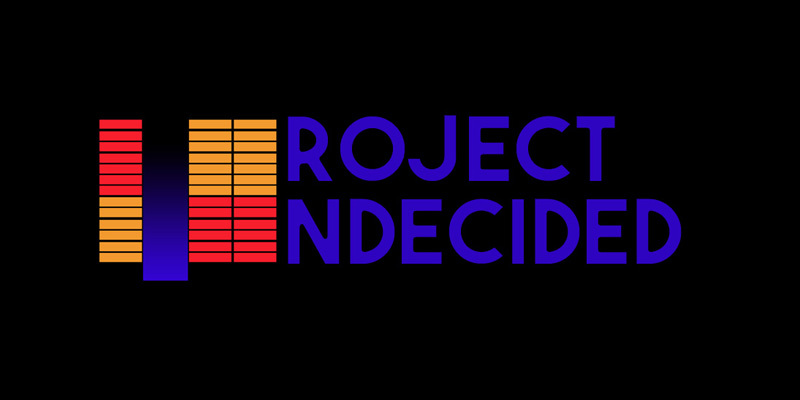 Recently, we’ve been looking for an alternative to the normal and sometimes arduous process of releasing an album. In the coming months we are going to be releasing a bunch more music and other treats. We have six more studio tracks we recorded with Jerry that will be coming out very soon. But, the SCI Sound Lab is intended to be a place where we can continue to experiment with a wide array of different recording concepts. One day, we might put up demos of new songs we are working on. The next, we might put up some dance remixes of previously released songs. We will also be going into the archives to find some band selected live material. The exciting part is that this will be a completely open space for creativity. 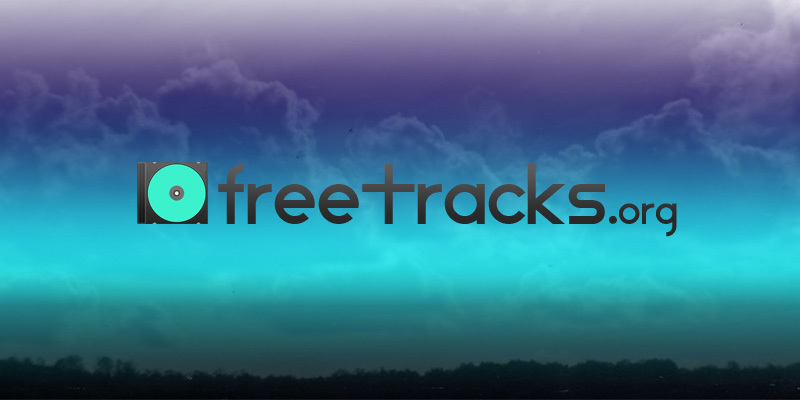 The aim is to create a vehicle for open expression – for us and our friends, guests, and even other musicians recording on their own – so that we can share more and more music with you, as easily as possible. We know we are not re-inventing the wheel here. 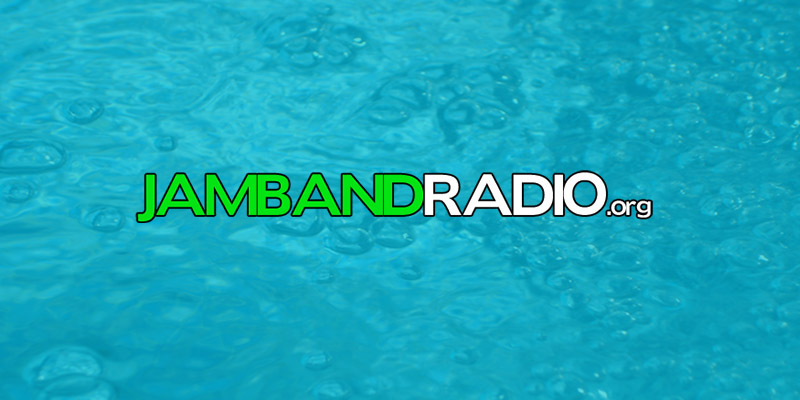 We’ve just grown a bit tired of not giving you guys more music, quicker and in a more efficient way. We are sort of making up the rules as we go. Will the music always be free? We are not sure. In a few weeks we are going to be announcing a pre-order that will feature the new music in different configurations than we are putting out today. Are we abandoning ever releasing an album in physical format? No. We are going to be compiling songs and releasing in vinyl and CD formats at some point down the road. 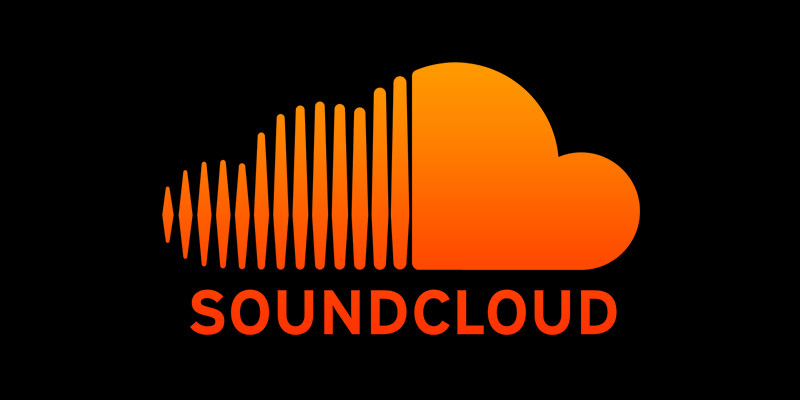 The music will also be going up on services like Spotify. 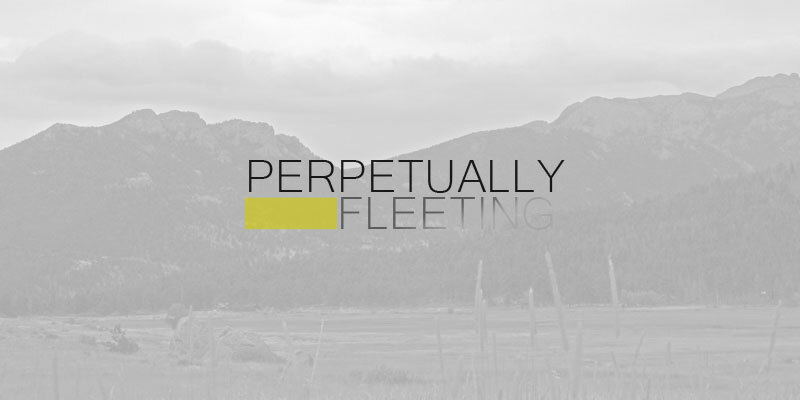 For now, we just wanted to get this music out to you so you can check out what we are up to. “Hey gang, we just kicked off a massive summer tour at Electric Forest this past weekend and we are so pumped to be out on the road playing music for you all! 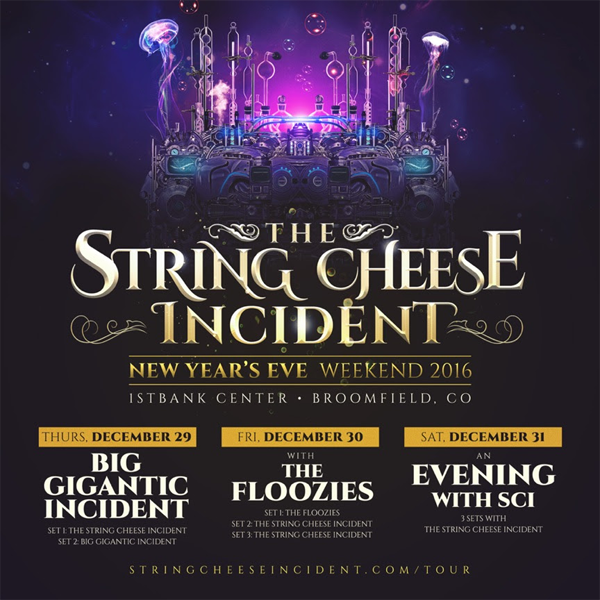 But we’re also always looking towards the future, so we wanted to share the news that SCI will ring in another New Year at the 1STBANK Center in Broomfield, CO, December 29th-31st! NYE in Colorado will be the final shows announced in 2016. 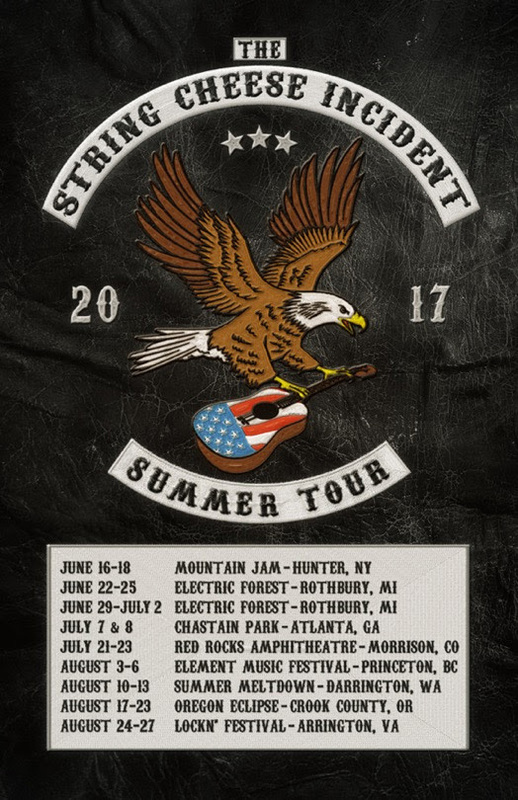 So that means Summer Tour will be one of your last chances to see the band before the fall/winter. 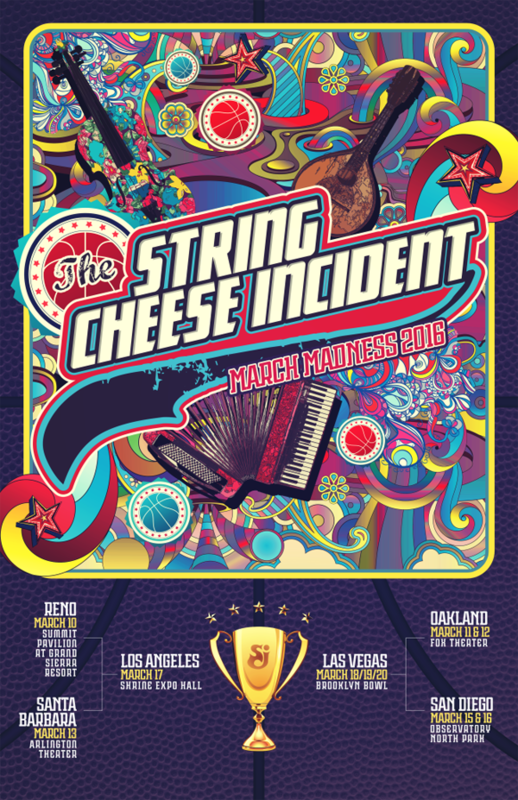 With 20+ shows coast to coast, there’s an Incident for everyone out there! 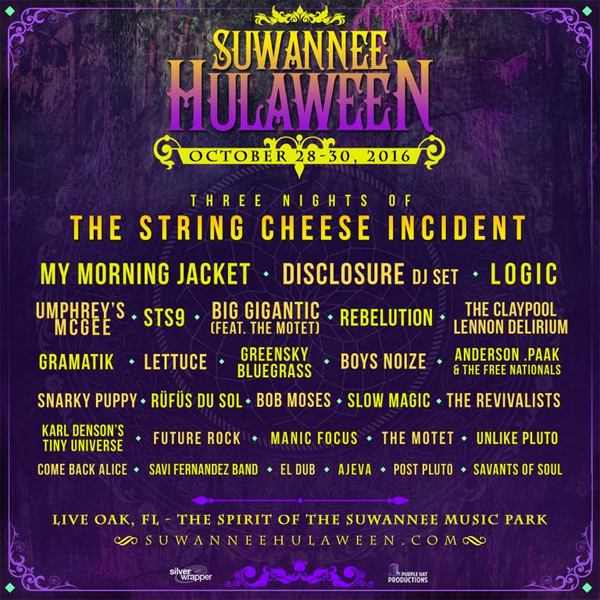 Come boogie with us! 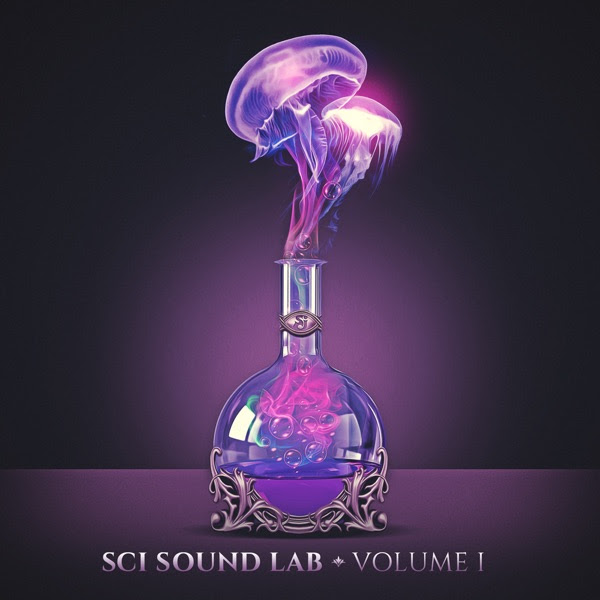 We’ll be spending most of the fall working on projects in our newly announced Sound Lab at SCI HQ. And then we’ll close out the year in style at the 1STBANK Center! 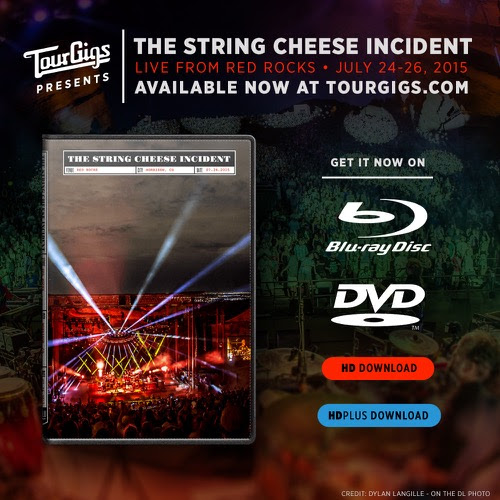 String Cheese Incident perform “Country Road Blues” at Red Rocks July 26th, 2015. 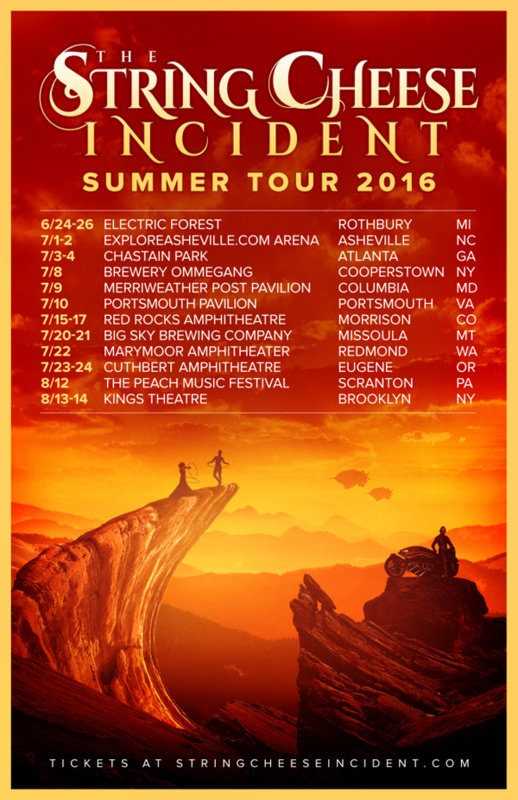 Peach Music Festival 2016 dates and lineup released! The 5th anniversary celebration will be held at Montage Mountain in Scranton, Pennsylvania. The festival dates have been set for August 11th-14th, 2016. 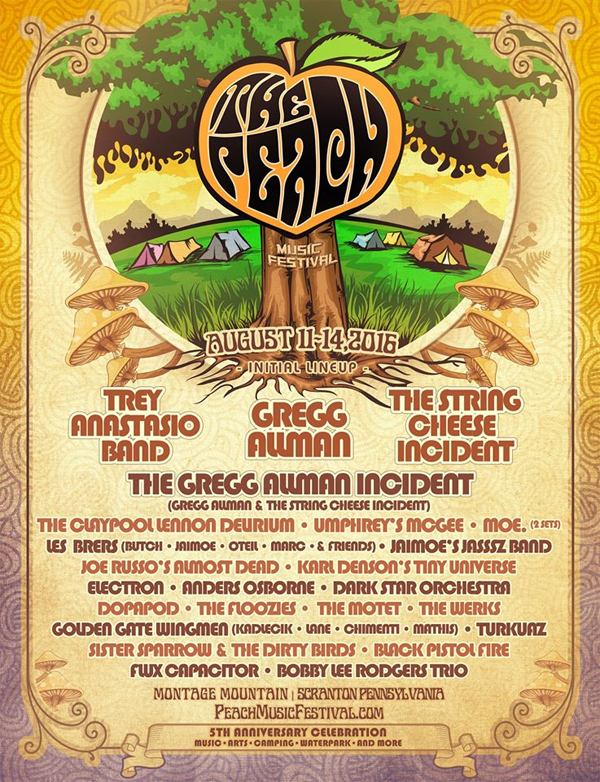 Peach Lineup 2016: Anders Osborne, Dark Star Orchestra, Dopapod, Gregg Allman, Joe Russo‘s Almost Dead, Karl Denson’s Tiny Universe, The Claypool Lennon Delirium, moe. 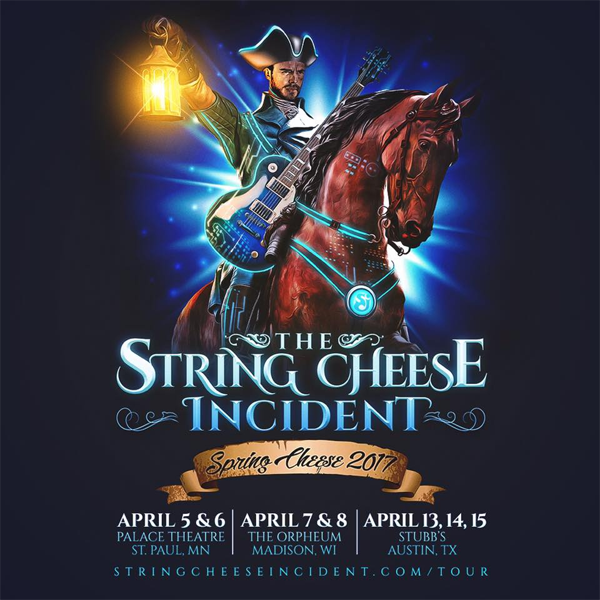 (2 sets), String Cheese Incident , TheFloozies, The Motet, The Werks, Trey Anastasio, Umphrey’s McGee and More. 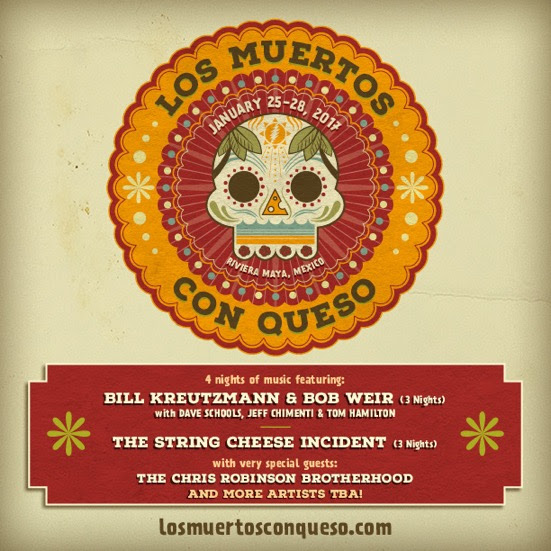 Tickets: Passes for the festival are available now – Get Tickets. 4-Day GA Passes will give you access to the festival grounds from Thursday, 8/11 – Sunday, 8/14, 2016. General admission $135-$160, Reserved $325, and VIP $500-$550. Camping passes sold separately. 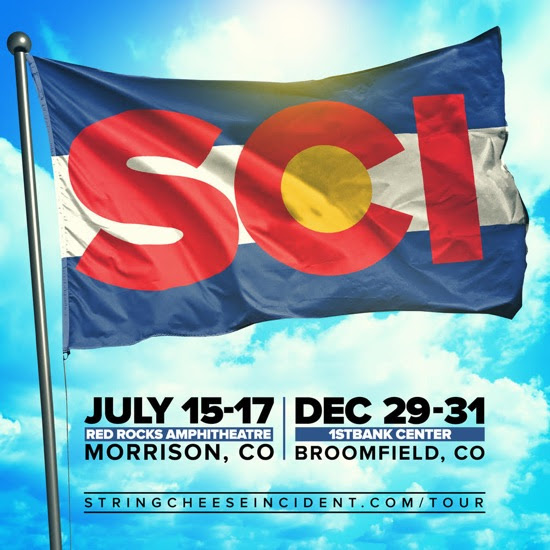 “The String Cheese incident will return to Red Rocks Amphitheatre this July for a three night stand at the famed venue in Morrison, Colorado. 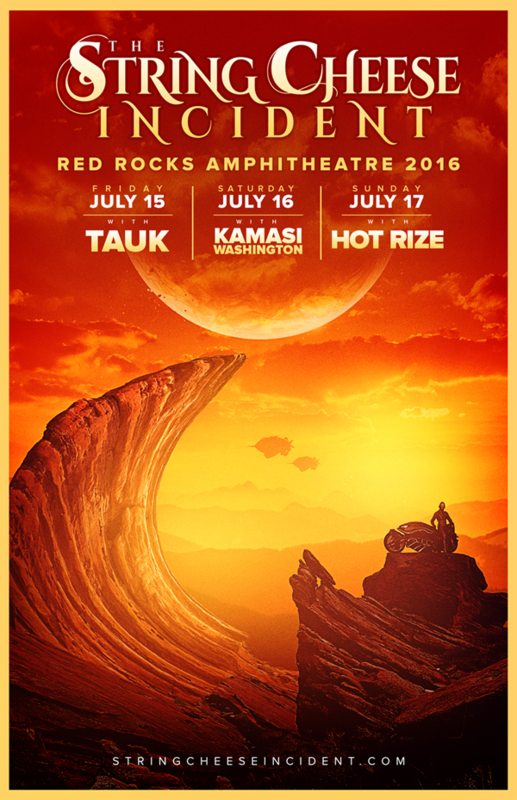 Joining in on the fun will be instrumental fusion rockers TAUK on July 15th, jazz saxophonist Kamasi Washington on July 16th, and bluegrass legends Hot Rize on July 17th. Electric Forest returns to the forest in Rothbury, MI! Tickets are already sold out for the event which takes place June 23rd-26th, 2016. 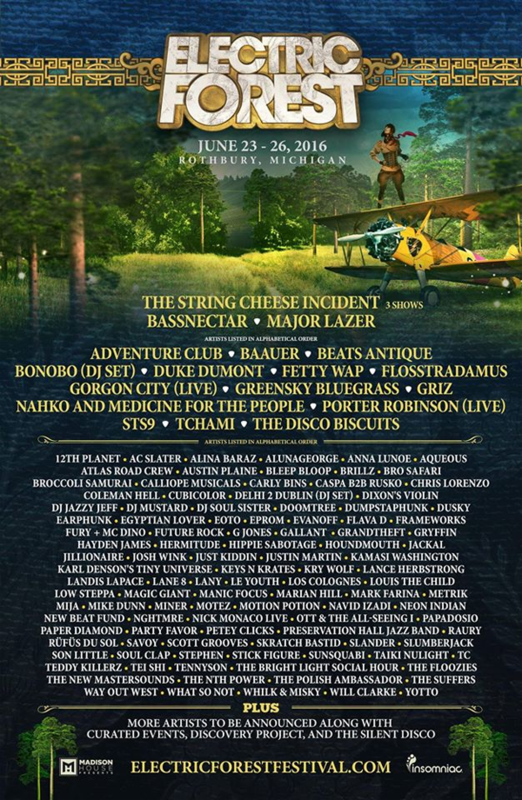 Electric Forest 2016 Lineup: Bassnectar, Beats Antique, Bonobo, Broccoli Samurai, Disco Biscuits, Dumpstaphunk, EOTO, Fetty Wap, Flosstradamus, Future Rock, Greensky Bluegrass, GRiZ, Karl Denson, Keys n’ Krates, Major Lazer, Papadosio, Paper Diamond, String Cheese Incident (3 shows), STS9, The Floozies, The Nth Power and Many More. Tickets: Tickets are Sold Out! 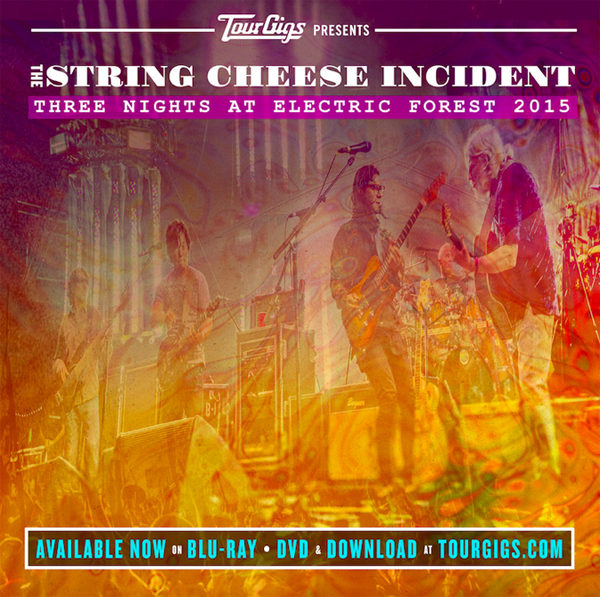 “The String Cheese Incident and TourGigs are pleased to present a special HD video offering of all 3 nights of SCI at Electric Forest 2015! Produced in stunning crystal clear quality, these spectacular Incidents are now available on DVD, BluRay, or HD Digital Download! Order each show individually or package all 3 together!